Acquiring a customer is expensive. Whether you’re paying with cash, or sweat equity, each customer has a cost. And value. There are many strategies you can employ to maximize the revenue per customer. For example, let me show you how you can maximize the revenue from the sale of a digital product. Subscription revenue can dramatically increase revenue per user. This requires automatic charges to the credit card on account each year, which only stops when the customer opts-out of the renewal charge (known as negative consent). Offering discounts for multi-year purchases upfront can increase your immediate revenue, and alleviate any headache associated with subscription renewals. Every product has at least one product that compliments it, if not more. Whether you are selling them, or a partner, the cross sale of other products can dramatically increase the revenue per customer. You can also sell advanced features and functionality to increase the revenue per customer. Telephone technical support is a good example of this. Extended downloads (offering the customer the ability to download the product for extended period of time) is a great way to extended the per customer revenue. There are many more ways to generate additional revenue per customer (over their lifetime), such as special offers via email, paid advertising for complimentary products and services, and the sale of other products based upon previous purchases (each of which can be optimized using the strategy listed above). Once you can determine an accurate Average Revenue Per User (ARPU), you can determine your maximum customer acquisition cost … and from there is becomes a numbers game of increasing the revenue while decreasing the cost. The difference between the two figures is yours to keep. Dynamic web pages are powerful tools that can increase your online conversions. A dynamic page is a web page that changes based upon certain pre-established “rules”. I typically advocate using them for landing and install pages, among other situations. You can grab all sorts of intel from the visitor’s machine (browser type, geographic location, operating system, connection speed) and from the meta data passed by the browser (referring URL, search keywords, campaign IDs). This information is then used to create a custom message, specific to the visitor. Here is an example of how Mozilla creates a powerful (and customized) landing page. This page displayed when we visited the Mozilla homepage using Internet Explorer. As you can see, they’ve identified our browser as being Internet Explorer, and have dynamically created a message targeting us as Internet Explorer users (“Internet Explorer is So 2006”). This message is slightly generic by design. It fits whether the user has already decided to download Firefox (as a re-enforcing message), or if the user is considering switching (as a call to action). 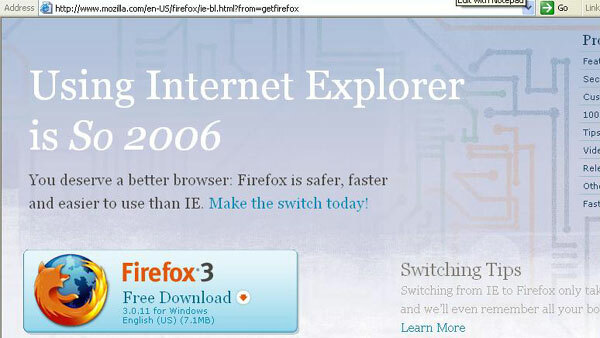 Notice also, in the lower right corner, they provide “Switching Tips” specifically for Internet Explorer users. Install the wrong version of the software for their computer’s operating system. Fail to disable anti-virus software that might prevent the installation of the software. Simply download the software, and not install it. Lose where they downloaded the installation file (it doesn’t always default to the desktop). Continually re-install the software (disrupting your install numbers) by clicking on the install icon on the desktop rather than the software shortcut. There are many things that you can do to help prevent situations like these. For example, identifying their operating system and browser type and creating detailed installation instructions will minimize the likelyhood of installation failure. I recommend offering the visitor the option for a basic or advanced install process, the latter offering detailed walkthrough screens which give instructions with screen shots on how to install the software. I also recommend offering direct access to your support team, for free, to assist with installation problems. An installed user is far too valuable to lose to a simple installation problem.